I finally have a finish! Here is Susan Rambo in all her wrinkled glory. I stitched it on a vintage 36 count fabric that is close in color to the amber/toasted almond Wichelt fabric called for in the SANQ chart. The fibers are Needlepoint Inc silks. 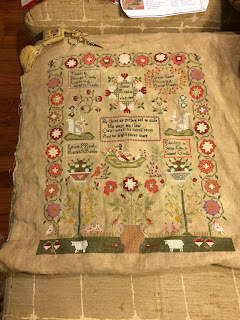 I love the colors and this is my all-time favorite sampler.